Promoting economic development through aesthetic improvement was the driving idea behind the decision to begin actively beautifying downtown Peace River, beginning in the fall of 2015. Part of our downtown beautification program this year The Town of Peace River is wrapping utility boxes along Main Street with art. We want YOUR help to choose the art. 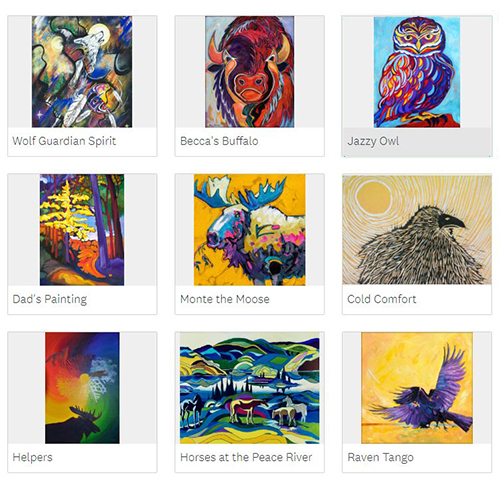 Working with Sharon Krushel of DonaBona Cards and the PEACE of Art group (Peace River’s local art club), we have sourced 9 art options from artists who are inspired by or live in the north. The art is colourful, vibrant and focuses on northern imagery. Please review the options and then rank the art options from 1 (most preferred) to 9 (least preferred). The Town will wrap the utility boxes based on the survey results. 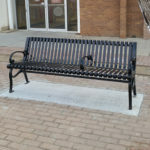 In the fall we installed six new benches, 15 new garbage bins, and 30 new bike racks along Main Street. 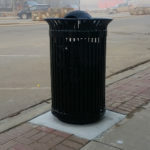 The new garbage cans are wildlife proof to help keep Main Street clean. The previous brick and stone garbage cans will be repurposed as planters in 2019. One of the six new benches installed along Main Street. 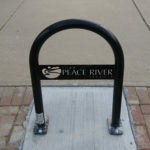 One of the 30 new bike racks installed along Main Street. One of the 15 new garbage bins installed along Main Street. 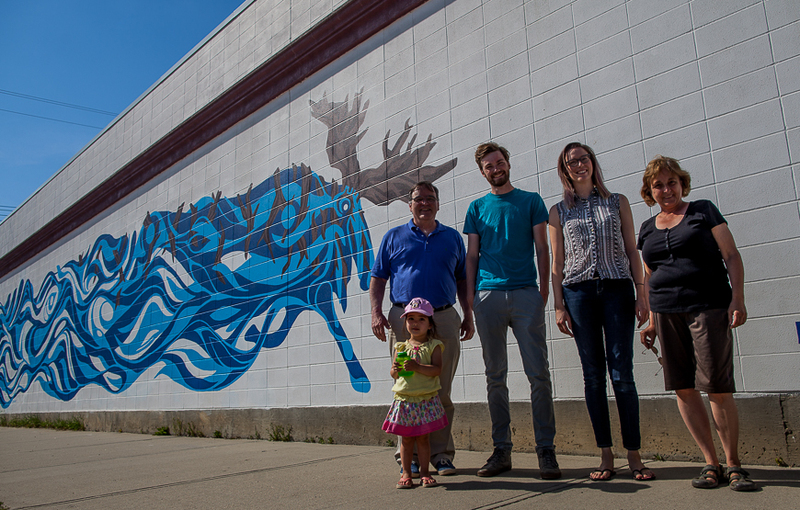 A change to the mural program had the Town of Peace River offering grant money for business and building owners downtown who wanted to have a mural on their building. Two grants were handed out and Andrew Olivier and Shannon Brown were both hired to complete murals. Painted by Shannon Brown located on the side of Peace River Brewing. Painted by Andrew Olivier and located on the side of the Great Canadian Dollar Store. A second mural was commissioned in 2017 through the Mural Selection Committee process. This time it was awarded to Shannon Brown, her piece is and is an ode to her love of the Peace Region. 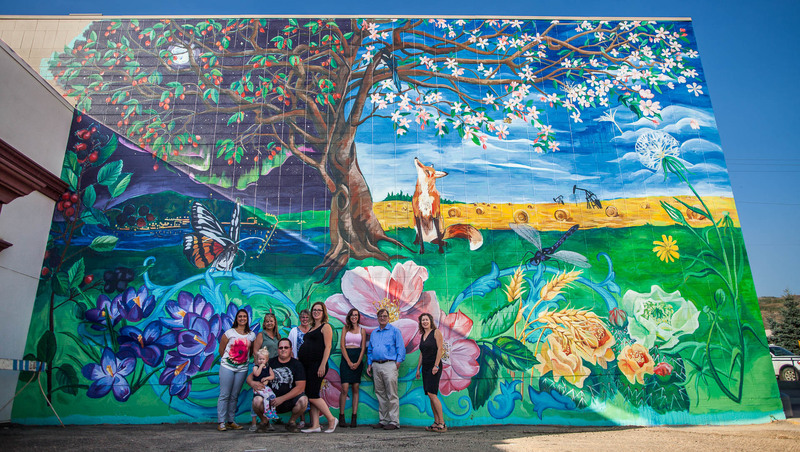 It emphasizes the natural vegetation and local plant life of the area by showcasing the Alberta Rose, Prickly Pear cactus, Crocuses, Saskatoons and Goats Beard along the bottom of the mural. A crab apple tree dominates the centre, inspired by the one that is still growing in her old backyard, with a magpie watched by an irritated fox. Members of the selection committee, the owners of Boston Pizza, the mural artist and Peace River’s Mayor were on hand for the official unveiling on Sep. 6, 2017. To celebrate Canada 150 elementary school students were given paint and die-bond panels and asked to paint mini-murals. These murals were installed along the sidewalk bordering the Fas Gas parking lot. Each panel was painted by a different elementary school. Early in the year, a mural selection committee was struck that included several community members. A call for artists was put out, and through that process, Andrew Olivier was hired to complete our first mural. The abstract piece celebrates the resilience of the Peace River community. Members of the mural selection committee and the mural artist pose for a photo in front of the completed mural. In October of that year the first banners went up on light standards. They sport a slick modern design utilizing the Town’s logo and components of the Town’s vision statement from the Municipal Development Plan; beautiful by nature, diverse by culture, vibrant by choice, with colours pulled from the Town’s logo. 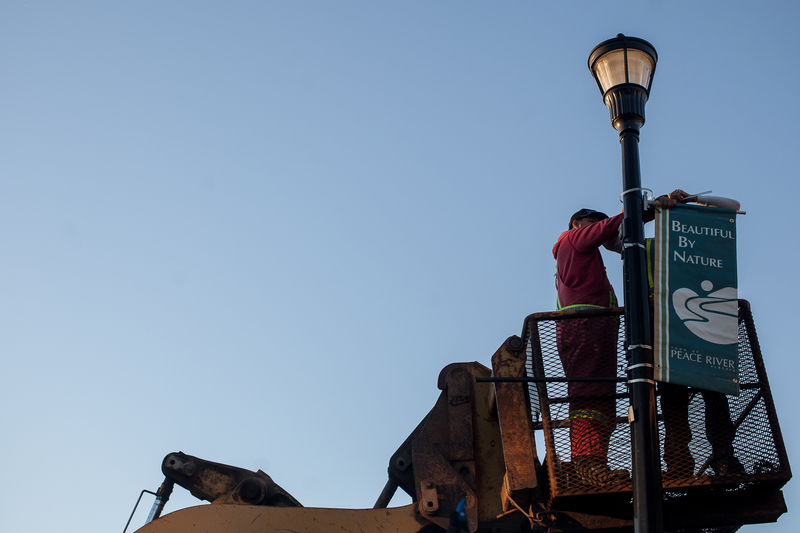 Workers install the first of the downtown street light banners in October, 2016. There are 10 commercial-grade evergreen trees that are installed in the Main Street median planters on each winter. These “Winter Trees,” are a seasonal addition that adorns Main Street every winter, all winter, as a means of brightening up downtown.